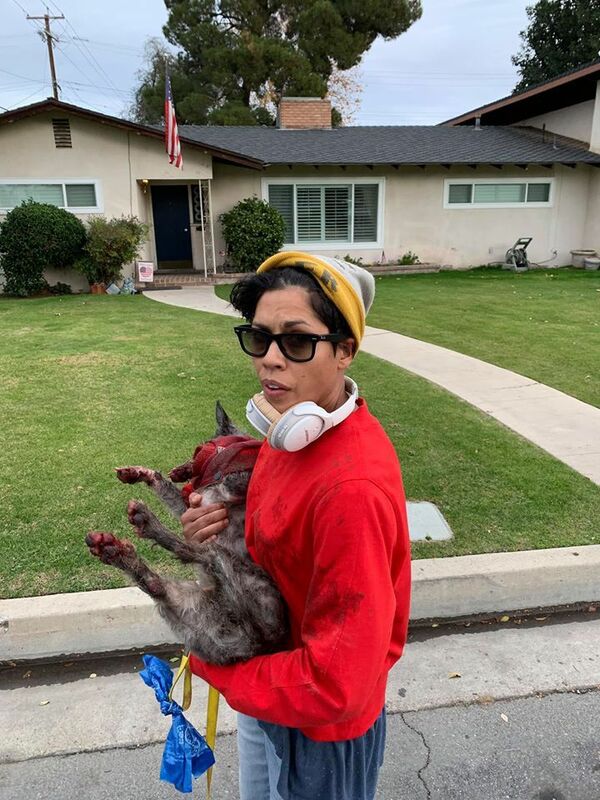 An image from the Facebook account of Brandon Sanders shows Elaine Rosa, the woman charged with a felony count of animal cruelty for allegedly dragging a dog behind a scooter. Eneria Atea, left, and Cindy Jones hold up signs during a gathering at the Bakersfield Police Department on Saturday advocating for justice for a dog who was recorded being dragged behind an electric scooter last week. Law enforcement authorities submitted animal cruelty charges against a Bakersfield woman Wednesday who was captured on video earlier this month dragging a small dog behind an electric scooter. According to a news release from the Bakersfield Police Department, authorities completed the investigation into the report of animal cruelty that was received on January 6. "Today, a criminal complaint was submitted to the Kern County District Attorney’s Office against Elaine Rosa, 39, of Bakersfield, who was identified as the suspect in this case, requesting a charge of PC 597(b) Animal Cruelty," police said. It's up to the Kern County District Attorney's Office to determine whether a criminal charge will be filed. Beginning Jan. 6, two local Facebook posts showed photos and video of Rosa riding a Bird electric scooter in downtown Bakersfield dragging a small dog behind it. The dog's name was later determined to be Zebra. "While riding bikes downtown on A and 20th street, we watched this (woman) riding one of the Bird Scooters at about 15 MPH dragging this poor dog behind her by a leash," Brandon Sanders wrote in a Facebook post Sunday. "The dog was on its side and we watched it being drug at least 100 yards and there's no telling how long she had been dragging it for before we saw her. You can see that its paws are all completely bloody. I was unable to get a good picture of the poor dog's side." Sanders, who included two photos of the woman holding Zebra, said he remained on the phone with the Bakersfield Police Department while following the woman to a nearby apartment. The following day, another Bakersfield resident posted home security videos showing the woman riding by on the scooter. Zebra, wearing some sort of sweater, was shown being dragged on the street. The woman is shown stopping and picking up the animal as two people on bicycles — one of them presumably being Sanders — pulled up beside her. At that point she abandoned the scooter and held Zebra in her arms as she walked to the apartment. BPD investigators were able to contact and question Rosa on Jan. 7. At that point they confirmed that the dog received medical treatment soon after the incident. In addition, a medical plan was established with a veterinarian and the dog's legal owner to address the injuries to the dog. Based on those details, the dog was permitted to remain in the care and custody of the legal owner, who is not Rosa, police said. Individuals convicted of animal cruelty as a misdemeanor face up to one year in a county jail and a maximum $20,000 fine. A call to Rosa's attorney has not been returned. way to go to the community members who spoke up and out!!!! this is the beautiful display of a community who sees something wrong and takes action. Too bad for her it wasn't a fetus she was dragging down the street. People would have been cheering for her to do with it what she pleased. What I have never heard explained is, what was this Looney woman doing with someone else's dog? If I was the owner of that dog, and I had seen that video of her apparent lack of empathy, I would be the one in jail! Thanks to the Bakersfield Police Dept. Hopefully the District Attorney can follow through. After seeing the picture of this Fiend smiling while holding a tiny bloodied dog saying "Shx0 Happens" I hope she gets a very HIGH fine as I don't believe she see a jail sale.